I'm still alive! April is a busy month around here...my nephew (who lives with us) is graduating, prom is this month and both my boys are going, my junior has baseball, we have several road trips happening, all of this on top of the regular work week so my crafting time is pretty much nonexistent! Of course I did find time to create my card for Sunday Stamps, I love this great team! Right now in Alaska the moose are all over the place....cows are pregnant and will be giving birth soon and with 14 hours of daylight they are really visible in the mornings and evenings now. 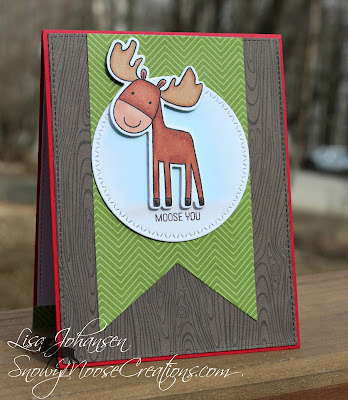 I still had the MFT Warm and Fuzzy Friends kit on my desk so I used the moose in that set to create my card! 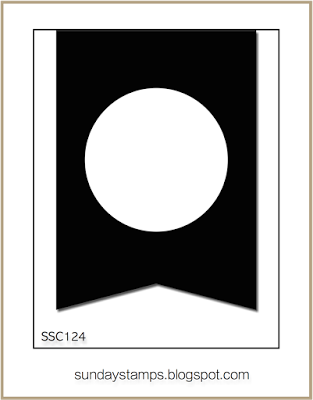 I stuck to the sketch and if you've been to my blog before I like to keep things simple, I'm not big on embellishments. This card is proof of that! I like the moose with the small sentiment under him and didn't feel like I needed to add anything else to the card. Make sure you head on over to the Sunday Stamps blog to see what the rest of the DT came up with and then play along! We also have a new team member, Heidi Baks! You may recognize her name from the Friday Mashup blog, and I am so excited to be working on a team with her still! Lisa, that little moose is about the cutest thing EVER! I need to get that stamp. As a Canadian, moose have a special place in my heart. Such a sweet take on the sketch. This is about as cute as can be! This is by far the cutest! Do you need my address??? Ha! Love this!